Would make sense. Been a while since new BMP-2 chassis have been made. In that instance, its not too bad - they're not adding any new vehicles at great expense, and the BMP-1/2 chassis will be in service for some years yet. 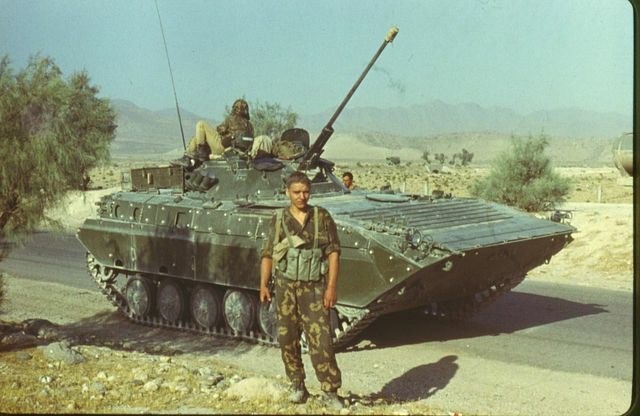 is there a change to also post some old pictures of BMP-1 and BMP-2 from the beginning on - so to speak from the 70s on? Remember to introduce yourself in the member introduction forum. First off : apologies for digging up this rather old topic. But i have a question regarding upgraded BMP-2 platforms in active service. Recently a new video was posted here and in other forums, which i believe to be part of the promotional material for International Army Games 2016. In this video we can see at least one BMP-2 upgraded IFV with Berezhok combat module (also known as BMP-2M). I have watched video's from previous editions, and so far ive only seen the classic BMP-2 configuration in use. Has the BMP-2M upgrade configuration been officially adopted in any significant numbers by the Army? Or is this vehicle just a technology demonstrator from the factory, or a limited production test platform? The only ones I have heard of were test ones. I have never heard of orders nor know of any units using them. In my experience the Soviets tended to introduce upgrades regularly on their existing forces including those in storage to keep them relevant. They tended to introduce only proven systems, but when they did an upgrade it tended to be to previous generation vehicles too. Recently they mentioned they would no longer purchase BMP-3s but it turned out they would no longer buy BMP-3s that they would still buy upgraded models like the BMP-3M etc. Based on this I suspect they will continue upgrades where relevant, though the alure of removing calibres from the inventory is probably very appealing to them, so eliminating the 73mm gun on the BMP-1 would make upgrades more appealing for some types more than others. 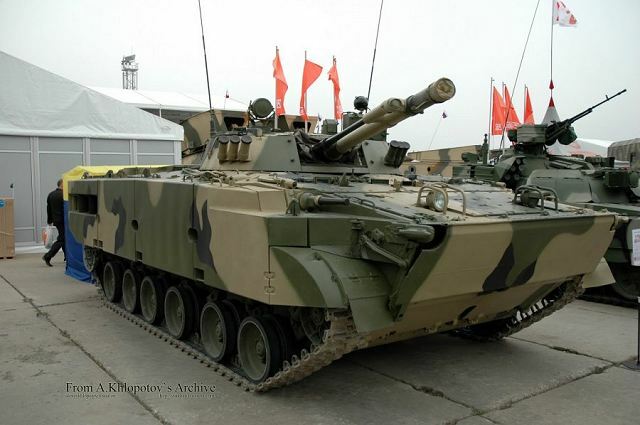 The fighting compartment "Berezhok" for infantry fighting vehicles BMP-2 and BMP-3 in the near future will start shipping in the Russian Armed Forces, not only for export, told reporters on Friday the company chief designer "Shcheglovsky shaft" (part of the NGO "Precision complexes ") Oleg Sitnikov. "The fighting compartment" Berezhok ", which is currently only available for export in the near future will be made for the Russian army," - Sitnikov said. Hopefully for the 580 BMP-2 slated for modernization from the previous post. So they just demonstrated brand new remote controlled turret and now they're buying late 1990's turret. OK.
KoTeMoRe wrote: So they just demonstrated brand new remote controlled turret and now 7they're buying late 1990's turret. OK. Remotely controlled turret has its own pros & coins and much more expensive than man controlled turret. This solution is reasonable and not so bad for an old platform like BMP-2. KoTeMoRe wrote: So they just demonstrated brand new remote controlled turret and now they're buying late 1990's turret. OK.
Cheap modernization makes sense, it's better to save money to acquire more K-25's. No amount of money spent for modernizing BMP-2 will give it K-25 performance. Remote control turrets make sense for the new vehicles with unmanned turrets but make little sense with previous generation vehicles. On a Boomerang or Kurganets or Armata an unmanned robot turret is normal as the crew are in the hull under the heaviest armour. On the BMP-2 there is no room in the hull for the gunner and the commander... it has a drivers position next to the engine and what was the commanders position behind him with the gunner in the turret as with the BMP-1, but moving the commander back into the hull and having no where for the gunner to sit is a step backwards. Remote turrets make sense for UGVs and the new generation vehicles but not as an upgrade to an old type. 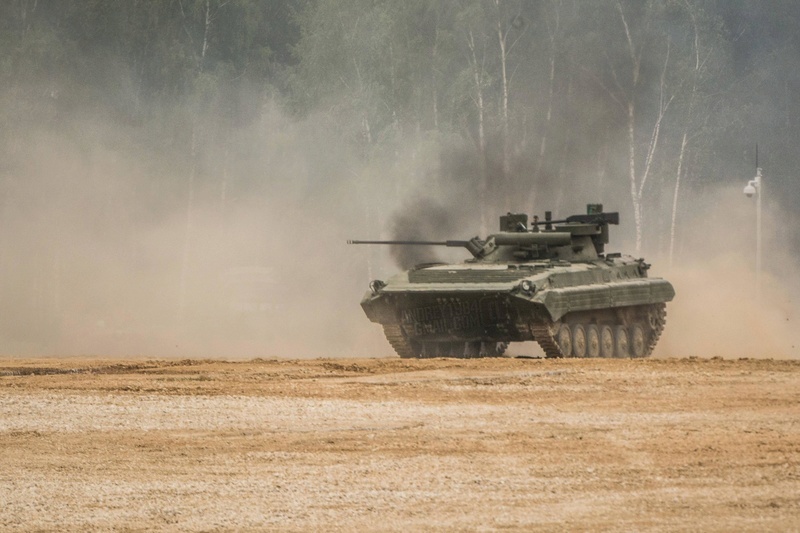 The Berezhok combat module has increased both the firepower and controllability of Russia’s BMP-2 infantry fighting vehicle (IFV), Russian Army Commander-in-Chief Colonel-General Oleg Salyukov said. 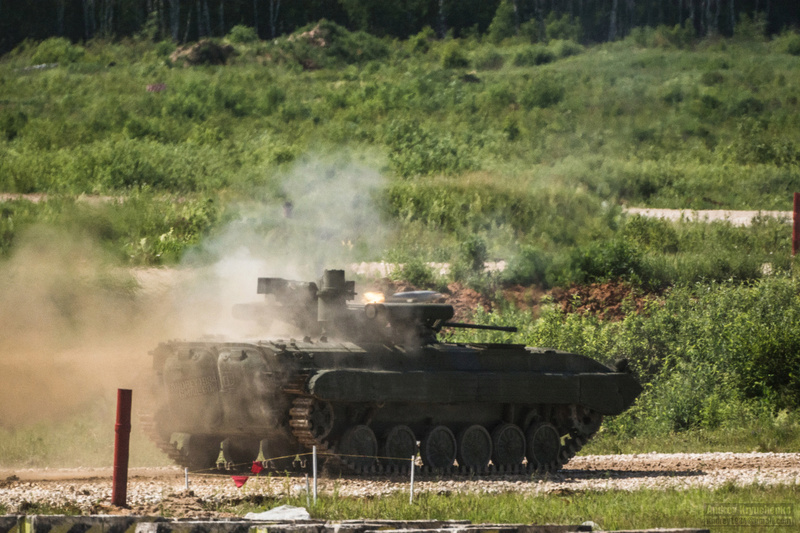 "Work is nearing completion to enhance the BMP-2 IFV’s firepower and controllability by equipping it with the Berezhok combat module. The promising B-11 infantry fighting vehicle that is based on the Kurganets-25 chassis and features improved characteristics is currently undergoing trials," Salyukov said. 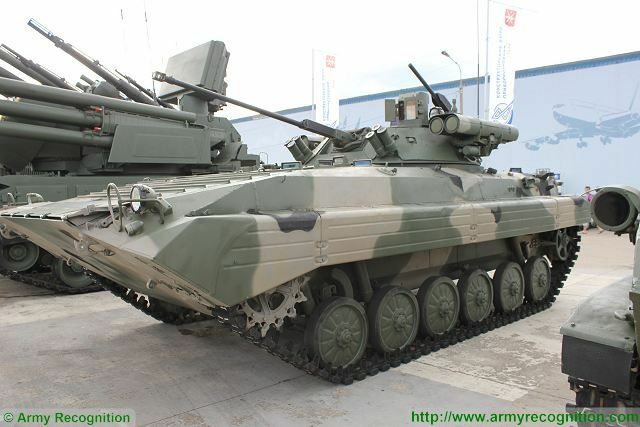 According to the commander, BMP-3 and upgraded BMP-2 infantry fighting vehicles are being purchased to arm motor rifle units and an advanced armored personnel carrier based on the Bumerang chassis has been developed. "In addition to the upgraded BTR-82AM armored personnel carrier that has proved its effectiveness, we are developing the advanced K-17 armored personnel carrier based on the Bumerang chassis, which will be superior to the best foreign-made analogs and incorporate more innovative solutions and cutting-edge technologies," Salyukov said. 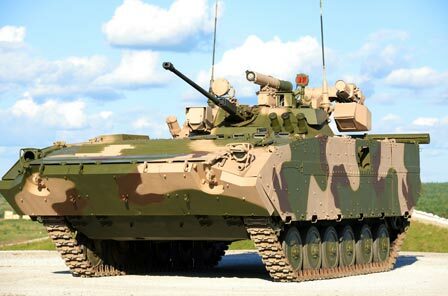 The Berezhok combat module has been developed on the basis of the serial-produced turret of the BMP-2 infantry fighting vehicle by the Instrument-Making Design Bureau on its own initiative. The Berezhok combat module is armed with the 30 mm 2A42 main gun used on the BMP-2 IFV, a PKT 7.62 mm coaxial machine gun. four 9M133 Kornet-E anti-tank guided missiles and one AGS-30 30 mm automatic grenade launcher. The Berezhok upgrade also includes a new fire-control system and optics. The BMP-2 IFV with the Berezhok combat module was unveiled at the MVSV 2006 International Army Weapons Exhibition in Moscow. I don't know how many BMP-2s will be refitted with the "Berezhok" combat module, but I think that they should also receive some additional side armor like the BMP-3M. Side armor on the BMP-3M. Pics of a BMP-2 equipped with some additional side/lower glacis armor. Is it confirmed that BMP-2s will be upgraded? If so the ground forces will enjoy some serious firepower and sensor upgrades. VladimirSahin wrote: Is it confirmed that BMP-2s will be upgraded? If so the ground forces will enjoy some serious firepower and sensor upgrades. I really hope so, but I don't know it for sure. 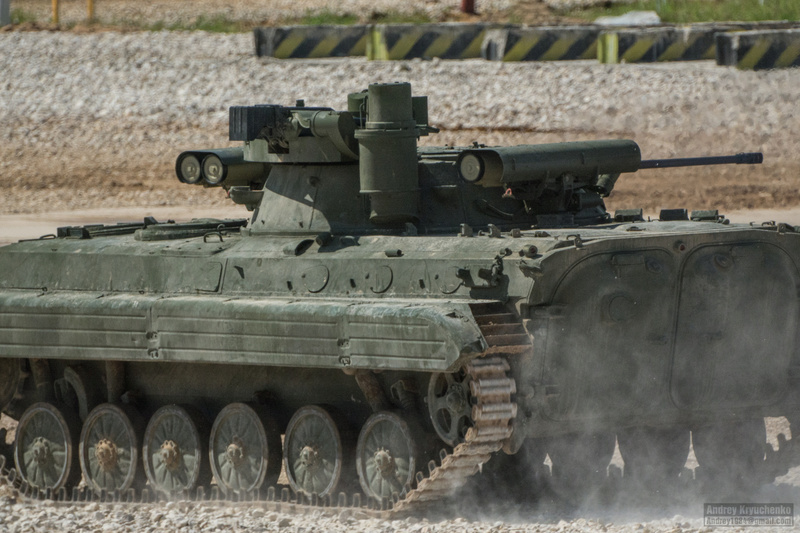 They should also install the Berezhok combat module to the BMP-1, since it would be more useful than the current, cramped one-man turret with that 73mm recoilless rifle. Speaking about the BMP-1, they should also upgrade their traction, crew compartment, engine, NBC defense and other systems/elecronics, and get rid of that two fuel tanks on the outside of the crew compartment doors. Edit: should read "first mention confirming"
Anybody knows what happened to Afghan war's BMP-2D (NATO called it BMP-2E) post-1989? I never noticed any in Russian service. miketheterrible wrote: New optics. So thermal? "The gunner`s sight has four channels: optical, thermal imaging, laser rangefinder and ATGM control channel. The commander has received panoramic sight with laser rangefinder and television channel." Even tho its quite stupid calling laser rangefinder as separate channel. If they decide to upgrade mass amounts of BMP-2's that would mean other vehicles are far more behind than planned otherwise there is zero reason to put money into such a project if things like the Kurg are just around the corner. Looks like the "Berezhok" upgrade, not really wise to keep working on BMP-2s anymore since Kurganets is on the way, but still a good choice for exports to upgrade to, although BMP-3s would probly be a better investment for them. SeigSoloyvov wrote: If they decide to upgrade mass amounts of BMP-2's that would mean other vehicles are far more behind than planned otherwise there is zero reason to put money into such a project if things like the Kurg are just around the corner. This would be geared towards exports. Lots of these things are in use around the world so it is a decent sized market. And does not look all that expensive. Remember, brand new 1000+ hp engine for T-72 costs in the ballpark of just 100.000$ so this kit is probably peanuts as well. Also, these vehicles will be going into reserve soon and it is always wise to keep your reserve up to date as much as possible.